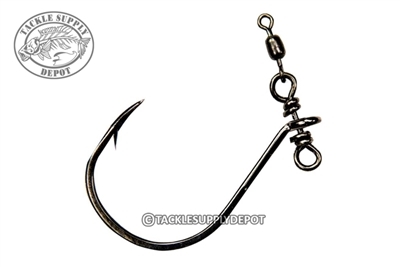 Mustad NTS548 No Twist Drop Shot hooks deliver hassle free performance that will find a permanent home in many tackleboxes. Designed with a small wire form running through the eyelet attached to a crane swivel which drastically reduces line twists. The Mustad No Twist Drop Shot hook features an up-turned, tapered eye and an Opti-angle needlepoint for lightning-quick hook sets. When dropshotting is the technique to get the bites the Mustad No Twist Drop Shot hooks deliver a specialized design that produces unparalleled finesse performance.